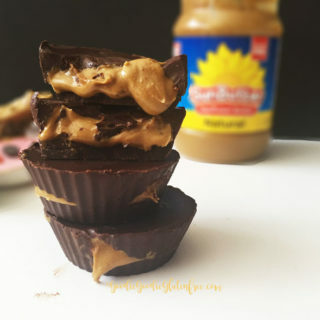 Homemade Salted Sunbutter Cups. 3 ingredients. Easy. Simple. 15 minutes of your life. Made in a microwave. You asked for easy. I listened. Are you drooling right now? These are simple ingredients you can buy at your local supermarket. Nothing fancy. You don’t need any fancy appliances either except a microwave. And in case you’re wondering what sunbutter is? It’s your nut-free alternative! Sunbutter is sunflower seed butter. Sunbutter is a brand I use because they are made in a dedicated nut-free facility and are top 8 allergen-free. That goes a long way in my book. Safety. I used the Natural Salted Sunbutter for this recipe, it makes all the difference! It’s super salty!! Wholesome ingredients and 15 minutes of your life. That’s it! And the end result? 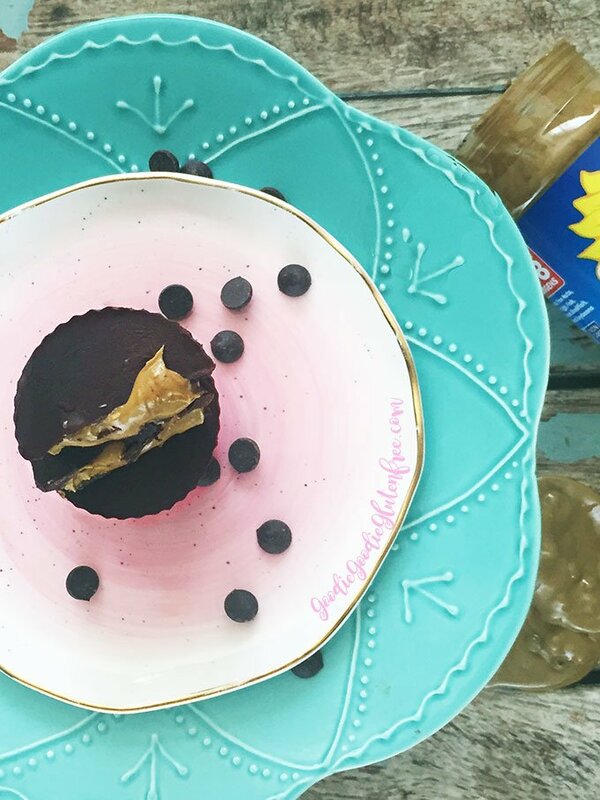 Well, you get a plate of chocolate sunflower seed butter cups goodness and well that’s a win in my book! Even if you’re sitting home super lazy on the couch and you’re craving chocolate, I’m telling you these are still the easiest to make! The most worth it too if you ask me. And worth getting off the couch to make. You win no matter what, just sayin. You cannot possibly make a mistake with these easy chocolate cups! Plus if you are like me with tons of sensitivities, and on tons of elimination diets, then this type of recipe works SO WELL! Using no added sugar what-so-ever, yet they are still decadent and delicious! I grew up on Reese’s Peanut butter cups. They were my “candy”. I can honestly say mine are SO MUCH BETTER! Line a muffin pan with 4 foil cupcake liners or use silicone liners. Set aside. Add chocolate to a microwavable bowl and melt for just under 1 minute in total. Check on mixture after 30 seconds and mix. Then add back to microwave for another 10-20 seconds. Add coconut oil and mix well. Spoon the melted chocolate into the lined cups, filling each one about 1/8-1/4 full. Place in freezer to set, about 5-8 minutes. Take a heaping 3/4 tablespoon of salted sunbutter and place on top of the set chocolate in a foil liner. Repeat with remaining cups. Spoon the remaining melted chocolate on top of the sunbutter in the cups, being sure to cover each one completely. Tap the pan on the countertop to even out and smooth the chocolate. Place in the freezer until set. Store these Homemade Salted Sunbutter Cups in the freezer in a sealed container or bag until ready to serve. Stores for up to 6 months. For the candida or sugar-free style chocolate cup use 80% dark chocolate or gluten-free carob. Allergies to sunflower seeds? No sweat! Use any of the following: walnut butter, almond butter, cashew butter, pumpkin butter, hemp butter, apple butter, pumpkin seed butter, watermelon seed butter and any other nut or seed butter of choice. 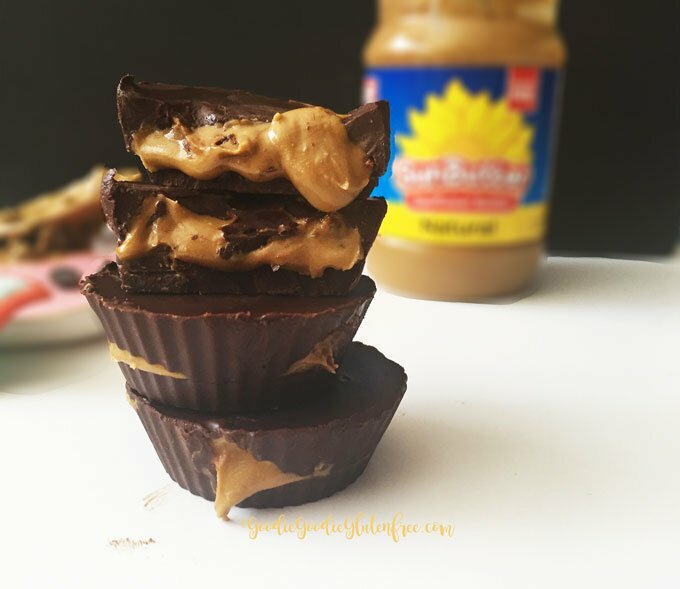 Easy Microwave Homemade Sunbutter Cups. 3 ingredients. Nut-free, Sugar-free, Paleo. Your perfect lazy dessert. Spoon the melted chocolate into the lined cups, filling each one about ⅛-1/4 full. Place in freezer to set, about 5-8 minutes. Take a heaping ¾ tablespoon of salted sunbutter and place on top of the set chocolate in a foil liner. Repeat with remaining cups. 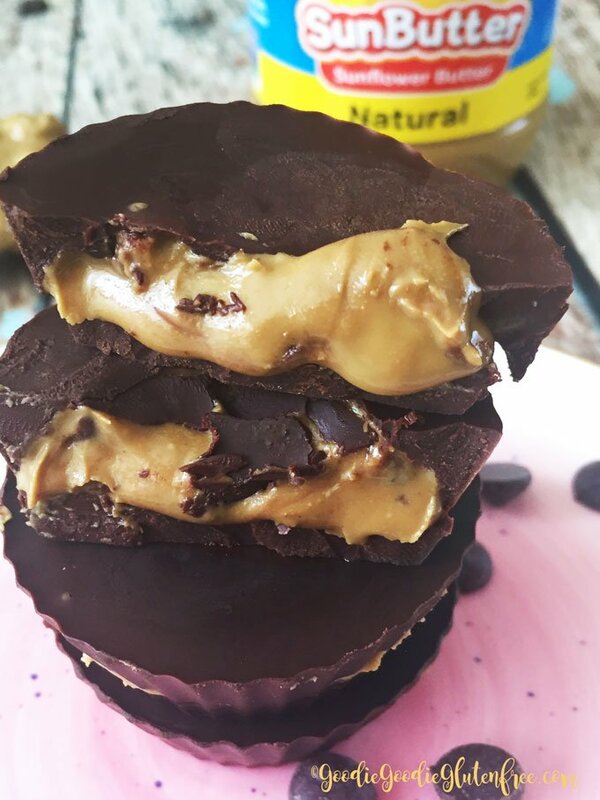 For the candida or sugar-free style chocolate cup use 80% dark chocolate or gluten-free carob // Allergies to sunflower seeds? No sweat! Use any of the following: walnut butter, almond butter, cashew butter, pumpkin butter, hemp butter, apple butter, pumpkin seed butter, watermelon seed butter and any other nut or seed butter of choice. « How to Change Your Mood Instantly!